In 2013 a new resident moved to River Road Animal Hospital, and he catches the eye of everyone who drives by. 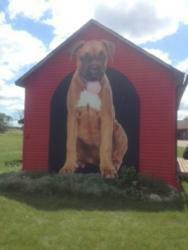 If you haven’t seen him, he’s a very large boxer in a very large red dog house. We often have people stop by just to take a picture of him. Once he’d moved in, we had all of our clients and friends submit ideas for a name, and finally chose the suggestion “Cecile”. Cecile Knuff was the original owner of the property and raised his family in this house, and was well-known among local residents – so we thought we’d name our big dog after him. Thanks to everyone who took part sharing their ideas, and stopping by to take pictures of Cecile!